Found one file extension association related to AVS Barcode Source and 1 file format developed specifically for use with AVS Barcode Source. 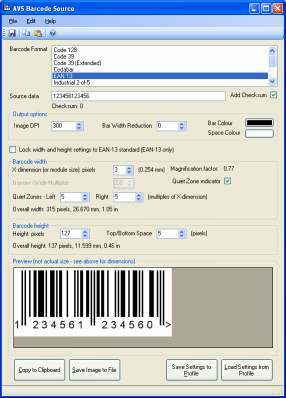 AVS Barcode Source is a Windows application designed to create image files containing barcodes. The barcodes can be of any size, with configurable parameters for setting colours, bar-width, height, quiet zone (to left and right of barcode), space at top and bottom of image, and various other parameters. The images are suitable for pre-press use - various bitmap and vector file formats are supported. Checksums are automatically calculated according to the specification of the barcode format chosen. Images may be saved as BMP, GIF, JPG, TIFF, EXIF or PNG format files - other DTP formats may follow later. Alternatively, the image can be 'copied' directly to the Windows clipboard, ready for 'pasting' into another application. The images produced may then be used in other products such as Desktop Publishing (DTP) packages, word processors, etc. The software is not a label designer in its own right, but rather a 'source' of barcodes, which can then be exported and used as desired in other applications. The AVS Barcode Source software seems to be old or discontinued. If you need more information please contact the developers of AVS Barcode Source (Alver Valley Software), or check out their product website.